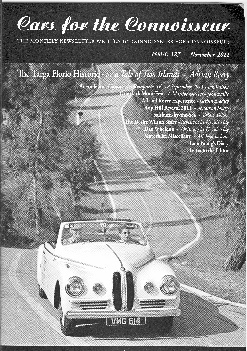 There was grea t excitement at Berry Buildings when the confirmation came through that our entry for the inaugural Targa Florio Historic road race to be run at the end of September '11 had been accepted. This was quickly followed by the nightmare realisation that we would be in China for most of September only returning to the UK two days before the race started in Sicily, so maximum attention to "forward planning & preparation" would be needed. This was not something the Team has been known for in the past, usually starting the packing on the morning of departure (or possibly the previous evening if departure was really very early), and usually driving to an event with the feeling of everything being (at least in our imagination) under our own control. So……..
First off, arrange flights from UK to Sicily to have us there the night before signing on/scrutineering. Then, book additional hotel stay for the day before. Then start to make arrangements for shipping the car before we depart for China, but only to arrive in Sicily once the race organisation was in place. Then carry out the usual pre-race checks on the car to make sure all is OK. Find that car is not 100% since competing in the Mille Miglia and so need to arrange for remedial work to be carried out. Agree with car transporting company for us to be able to deliver the car to them early, and for t hem to securely store the car until needed for shipping. Find that availability of the parts needed is nonexistent, and so have to chase around investigating alternatives. Consider commissioning small batch run just to get single part, but eventually find NOS hiding at back of store wrapped in paper so old that it cracks when unwrapped. Car fixed just in time to deliver to transporting company. Go on holiday to China! Enjoy wonderful food, unique sights, and pleasant warm weather. Return to UK for one and a half day's work (with all that entails), before packing remaining clean clothes and quickly flying off to Sicily. On approaching Sicily, an hour late at 22:00, the pilot announced that Etna was "looking spectacular". This was closely followed by "the airport at Catania is now closed so we are diverting to Malta". Malta?? What the….? Land in Malta, wait on tarmac for an hour. Finally taken by bus into airport buildings, wait for another hour. Airline is unable (unwilling) to confirm when they will fly back to Sicily. Investigate alternatives, and find ferry leaving at 06:45 next morning. Make own arrangements for hotel in Valetta (close to harbour) rather than accept airline offer of stay on opposite side of island. Four hours sleep and board ferry. Ferry docks in Sicily one hour late at 09:00, and we arrange taxi to take us the full length (south to north) of the island to pick up car from store and then drive to scruitneering and sign on. Organisers agree to hold open scruitneering by additional hour pending our arrival. Two hours into the taxi ride and the organisers contact us to advise that they will arrange for our car to be picked up and transported to scruitneering, so we can come directly to signing on. Eventually arrive at signing on, and complete the paperwork. Enquire about the car. "Yes, we were wondering where your car has got to" comes the reply from the organisers. Check paperwork, and see that our start time is 14:32, 40 kms away from where we are currently, without car, and it is 13:30! Told to have lunch and relax by the organisers. Easy for them to say that. Transporter eventually arrives with car. Hooray! Driver then informs us that there was a problem with the handbrake and that he has had to slacken off the adjustment. Diagnose that certain people do not recognise how a fly off handbrake works, and once the car is off the transporter, set to finding appropriate sockets, etc. to adjust the handbrake so that it works. Cannot find the perfect socket (I know we have one - somewhere) so use what is currently to hand. All the while, fending off "helpful" comments and interference from Italian onlookers. Driver now getting all hot and bothered. Adjustment made and go to drive to scruitneering to find handbrake will not disengage. More rummaging in tools and handbrake released again, but now not engaging. However can drive to scruitneering, only to be told that they have now all departed. Organisers agree after much discussion to scruitineer at a later stage. We are now the only car left in park, and gladly accept offer from a lone official to lead us directly to the start. Off we set at a super fast pace down a motorway, with the navigator checking off the notes. At exit slip, official goes in opposite direction to notes and we end up on dirt road, in building site, in a queue of lorries waiting to cross over a railway line. Navigator gets out and communicates our disquiet to the official in the car in front, who does a good impression of Michael Winner, with a "Calm down dear, I know what I am doing. It will be all right." Finally, train goes by and we re start the drive. Miraculously, we appear at the race starting area. Of course each official demands that we "wait our turn" until they see our number and frantically wave us past all of the other cars. At one point, someone rushes over and sticks the transponder on the car, and off we go again. Then the GPS tracking is slapped on the windscreen, and we continue to thread our way through the increasing congestion to the actual starting point. Arrive and pick up time sheet - stamped with 14:32 as confirmed on the count down clock by the side of the road. How on earth did we manage that? And so the race begins. The event is run by the same people who run the Mille Miglia, and who use the same approach of a mixture of time checks, place checks, and average speed checks, the latter being timed to hundredths of a second. As this was their first race in Sicily there were the obvious glitches in organisation that were only to be expected. The roads were either billiard table smooth or severely suffering from subsidence. Unfortunately the vast majority were the latter. However the navigator saw to it that the driver did not "hang the back out" too much, and as such, the tyres (which were a major worry having spoken to others who had previously driven in Sicily) stayed intact for the entire race (unlike the Mille Miglia). We soon became adept at sensing what a really bad slip in the road looked like, but not before several hard groundings had taught the driver to stop enjoying himself and concentrate. Also on the stages around the top of Etna, we needed to keep a look out for lava dust blown across the road at unexpected places, usually on bends, that proved to offer absolutely zero adhesion. That proved exciting as at these places there always seemed to be sturdy walls on both sides of the road, ready to bite the unwary. The driving times were not quite as arduous as on the Mille Miglia, but even so we were both dead to the world as soon as our heads hit the pillows at each of the overnight stops. After having driven all around the island, visited many villages with very narrow, picturesque streets (that required several three or more point turns to navigate around), and stop offs at all of the historic places associated with the Targa Florio (including the official museum), the race was over. We managed 26th out of the 46 historic cars that took part, and although we incurred zero penalties on any of the timed checks, we still need to improve our performance on the average speed stages. The organisers advised us during Saturday that the cost of the pre-booked car to take us from the hotel back to Catania airport on Sunday evening had inexplicably changed from an already extortionate €120 for the 160 kms, to a mind blowing €250. Not phased by this, the navigator promptly rang Palermo airport and booked a hire car for pick up on Sunday morning and to be left at Catania airport on the Sunday evening. The celebration dinner on Saturday night brought forth the usual crop of tales of deering do (and some tall ones as well). Sunday morning saw us in a taxi going to Palermo airport to pick up the hire car, and then a dash back to the hotel in time for the shuttle to take us to the prize giving. We had already been told that the site was an historic monument that did not have any accommodation for parking, hence the need to be back at the hotel. Due to some unforeseen problem, the shuttle coaches were substituted for multiple taxis to take us from the hotel in the centre of Palermo to the historic Castello Utveggio on the very highest point overlooking Palermo and the surrounding country side. Our appointed taxi came and five of us piled in and off we went. Five minutes into the journey, the taxi came to a halt in the middle of the traffic, to an accompaniment of a concerto of hooting horns. The driver made repeated attempts to restart the car to the sound of the starter getting slower and slower. We have all been there and can recognise the point beyond which turning over the starter is a pointless activity. Our driver, wanting to keep his fares, just continued until there was no more battery left. Frantic calls to his dispatcher, to the organisers, and probably to his brother in law for all we knew, eventually half an hour later brought a replacement taxi to allow us to complete our journey. The prize giving over, and the celebration lunch and then back to the hotel for us to pick up the hire car and gently drive to Catania airport. A short plane journey home, and then the arrival of the valet parked car, to find a freshly dented passenger door. Finally we arrive back safely at Berry Buildings. p.s. The number we had been allocated in the race - 113. I wonder if that was significant?